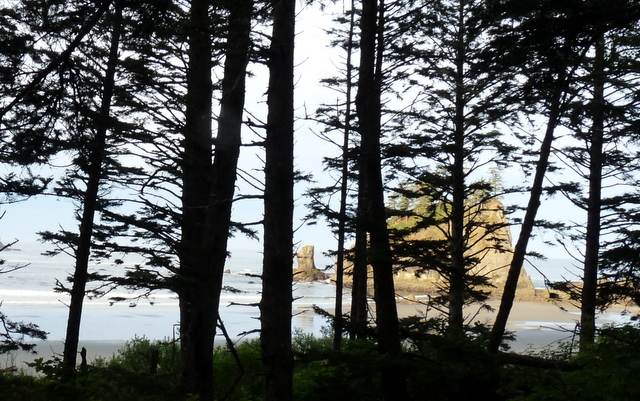 We explored Olympic National Park’s 2nd Beach, near LaPush, Wa, this morning with Hope, the NPS Interpretive Ranger. She really knows her stuff, having majored in Environmental Sciences with concentrations in marine biology and invertebrates. We don’t know what all that means, just barely can spell it. But Hope had a name and a story for all the things she picked up or we pointed out in the tidal pools. Yesterday evening a NPS Ranger stopped her car outside our RV and walked over. 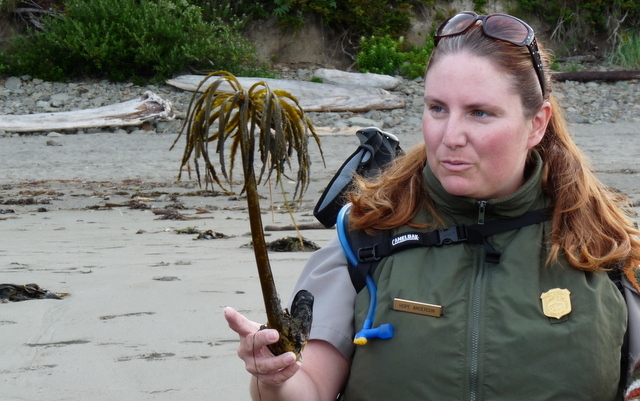 We thought, “Oh great, we’re going to discuss the firewood or the generator or maybe cougar precautions.” But her purpose was to invite us to the 8 p.m. Ranger program at the amphitheatre, the topic would be kelp beds, tidal pools, sea grasses, and other things. Bundled up warmly against the evening chill, we walked 1/4 mile to the amphitheatre, plopped our Crazy Creeks on a big fir bench and chatted with Hope as the other six people arrived. 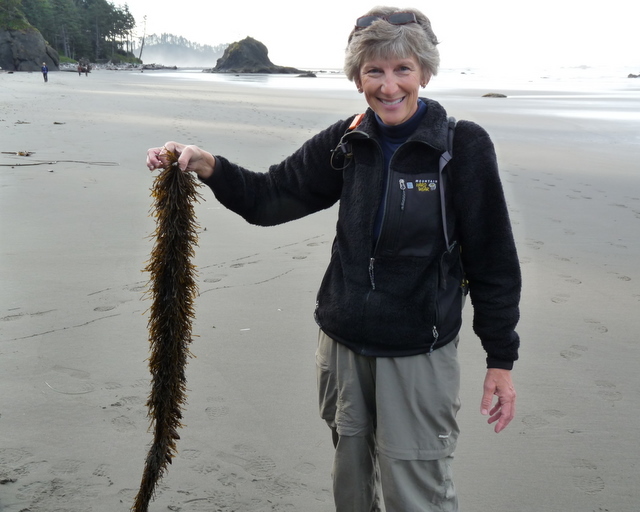 Promptly at 8 p.m., Hope started the program, discussing marine life in the local tidal pools. She used projected pictures and many plastic bags with examples of the black turban snail, or whelks (spirally), little barnacles completely out of their shell, and many other small critters. Hope said the program ran over its time but we weren’t noticing. She then announced a guided hike to 2nd Beach starting at 8 a.m. Ouch! Consistently sunless and cool mornings have kept us cozying in bed until after 8 each morning this week. We set the alarm clock for a little before 7, and awoke to the brightest morning so far. Or maybe they’ve all been this bright at 8? We wouldn’t know. An eight-mile drive brought us quickly to parking at the trailhead for 2nd Beach and we hiked down with a few others following Hope. Our group hit the beach by 8:20, a little before the 9 a.m. low tide. Hope led us toward a large group of rocks and pools, stopping a few times to pick up green things. We neither one pick up many things when we’re walking on the beach. Which sea creatures have venom at this end or that end or on these tentacles, and what if this isn’t even a sea creature but some kind of excrement? You just never know, you know what I mean? Today we picked up bull kelp, feather boa kelp, demised starfish, and four or five other things we already forgot the names of (next time, we’re taking a notepad). Hope did a great job of explaining how these things live and eat and why we find them on the beach during low tide. 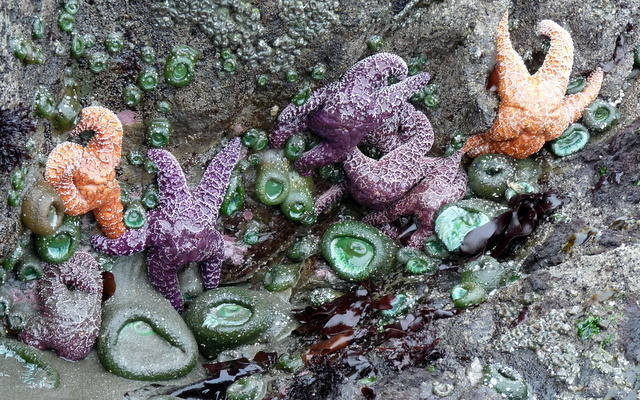 Did you know the pecking order between starfish, barnacles, and mussels on large rocks? The sea stars stake out the lower third, and eat on whatever else parked there, mostly barnacles and kelp perhaps. You might see in this picture the three somewhat distinct layers? 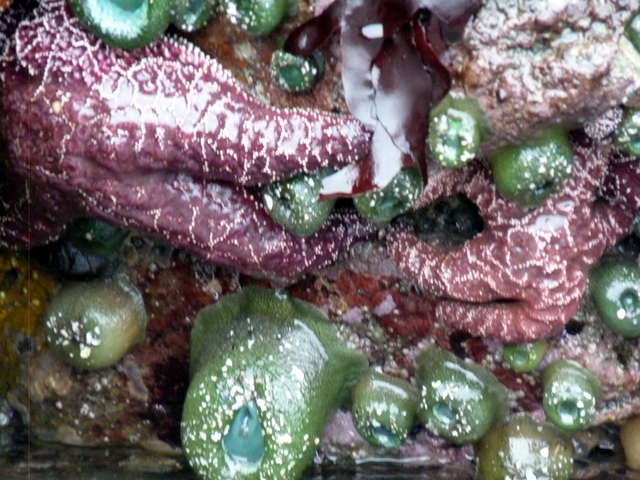 The barnacles are on the bottom 2/3, but the lower ones are on the menu for sea stars. The mussels seemed adept at climbing highest to avoid bumping into sea stars. We had fun finding so many colors in these tidal pools. Sea stars and anemone and kelp were the showiest, with sea stars alone showing red, purple, and orange individuals. All this is easy to spot at 2nd Beach during low tide. A couple of hours had gone quickly and Hope turned us out on our own. 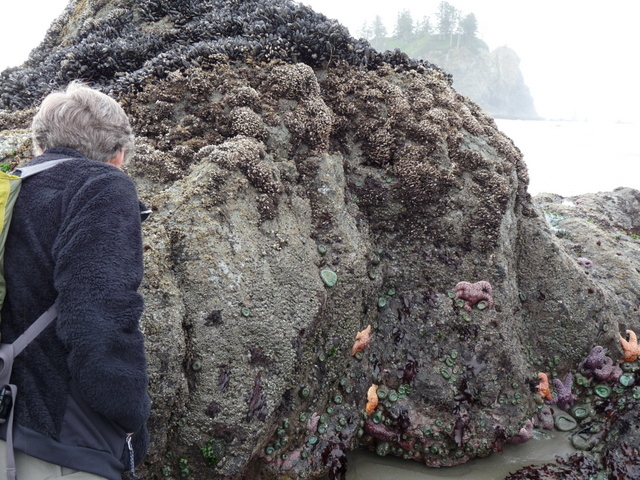 We walked to a few more large rocks then walked the length of the beach, finding a few more interesting tidal pools with very cool giant anemone. The anemone is the above picture are closed up, waiting for the tide to roll in. The anemone in the lower picture is open for business, tentacles all accepting any food that happens within touch. We’ve spent a lot of times at beaches on the Atlantic and in the Gulf of Mexico over the years. And haven’t seen anything like this before. Our exposure to Pacific beaches is very limited, and we had no idea this kind of thing goes on. 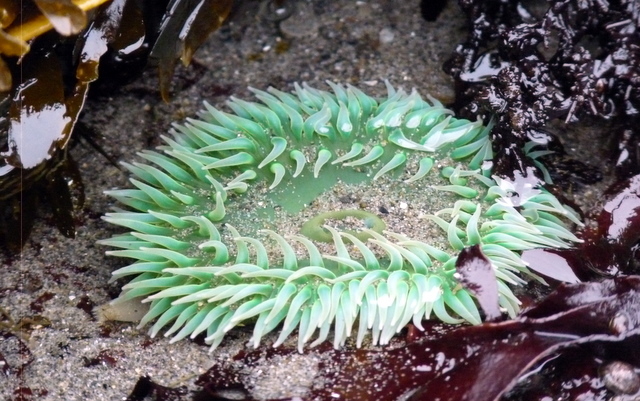 We have an entirely new appreciation of life in the tidal pools. Good thing we went to last night’s program. Now we’re curious what tonight’s Ranger program will be.